"How Patient Is Patient?" - Can Powell Keep The Market's Dream Alive Today? The last month has seen a roller-coaster of chaos in stock markets, Fed attitudes, and market-implied expectations of Fed sentiment. And, as Standard Chartered's Steve Englander warns, the recent acceleration in asset-market prices means higher bar still for Powell and Clarida to satisfy investors today. The bar for Fed Chair Powell and Vice-Chair Clarida to encourage markets is higher tomorrow than today or last week. Asset markets have digested the chorus of Fed officials referring to “patience” and indicating more flexibility on the pace of balance-sheet reduction than ‘autopilot’ would suggest. At a minimum, investors will look for Powell and Clarida to endorse the recent asset-market-friendly Fed comments. Any effort to hedge or walk them back would probably lead to quick selling. We recently lowered our 10Y US Treasury yield forecasts to 2.75% for end-2019 and 2.50 for end-Q1-2019 (Waving goodbye to 3% territory). Asset markets have rebounded significantly over the past week. To move further, they will need decisive confirmation from Powell and Clarida that the pause is likely to last through H1 (in line with our revised Fed view – New year, new forecast) and that US policy rates are near a peak. Rates-sensitive EM currencies have been the main beneficiary of the rebound in risk appetite, but G10 currencies have also rallied against the USD. If comments from Powell and Clarida disappoint, the resulting equity pullback would favour USD-JPY downside. The EUR’s recent rise over 1.15 cleaned out a lot of short EUR-USD positions, and given the economic and political challenges, it could reverse rapidly. That said, Fed speakers such as Kaplan, Bostic, Evans and Bullard would not be as explicit as they have been on the desirability of an extended pause if they did not feel that FOMC sentiment had shifted, in our view. Powell speaks to the Economic Club of Washington at 12:45 EST, without published text and taking questions from a moderator. Vice Chair Clarida speaks to the Money Marketeers in New York at 17:30 EST, with a text and taking questions. Powell was much more vague last week. His exact quote on patience was: “With the muted inflation readings that we see coming in we will be patient as we see how the economy evolves.” Being patient on how the economy evolves is not necessarily the same as being patient on rates. He will likely be asked whether he adheres to the Bostic/Kaplan or the Rosengren definition of patience. Clarida will likely similarly be pressed. 3. Powell has talked about the balance sheet being on autopilot; the minutes said, “Some participants commented on the possibility of slowing the pace of the decline in reserves in approaching the longer-run level of reserves.” While one can debate the fundamental impact of balance-sheet reduction on asset prices, asset prices reacted negatively to ‘autopilot’ in December and have reacted positively to signs of flexibility this year. 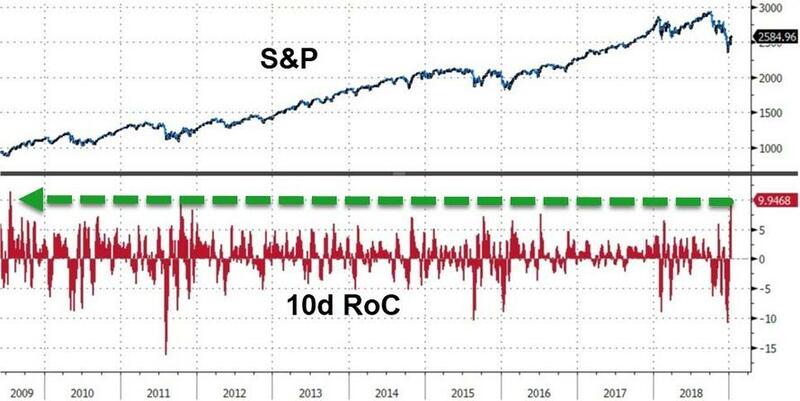 So, can Powell keep the greatest 10-day run in stocks in a decade going?